Introducing Laser X: The Ultimate Laser Gaming Experience. Full-color lighting effects and stereo sound make you feel like you're inside a video game! Compatible with all other Laser X sets. 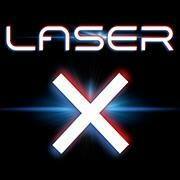 Laser X is the Ultimate Laser Gaming Experience! 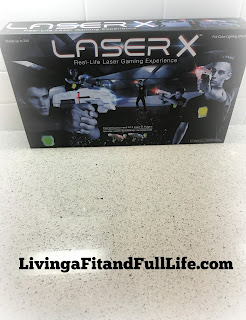 My kids absolutely love their Laser X Two Player Laser Gaming Set and have been having a blast playing. We recently moved into a new house right across from the park so in the evenings we head over to the park so the kids can play Laser X. It's an absolute hoot to watch but even more fun to play. My husband and I now take turns playing because even we have a blast playing. I love that you can have teams or go rogue and add on more Laser X players which we definitely intend on doing. The accuracy seems very good and the interactive voice coach is pretty cool! You can also plug in headphones and hear the Laser X Soundtrack and Sound Effects which makes the game even more fun. Laser X is extremely fun and my family and I highly recommend it! 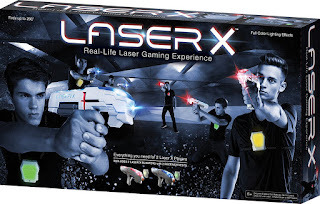 Laser X is available at Toys "R" Us, Target and www.GetLaserX.com! Follow Laser X on social media!